Food court food isn’t typically known to be great, but then food court food isn’t generally Middle Eastern. 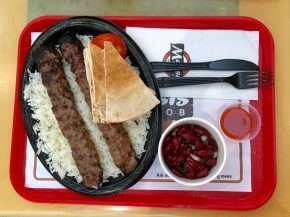 Massis has kind of built a food court empire around LA, dishing out mostly Middle Eastern food with a sprinkling of random things like Argentinean Skirt Steak and Idaho Trout. I found myself at the Santa Anita mall and went looking for kabobs.